How do I get information on voting? What is the phone number for the Post Office? What is the phone number for the School District office? 920-779-7900 for the Hortonville Area School District Administration office. How can I contact the Municipal Court Clerk? Call the Court office at 920-779-9542. 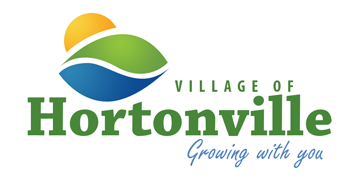 What is the phone number for the Hortonville Public Library? See the Links page to get to their website. What is the phone number for Diggers Hotline? How and when do I license my dog? All dogs must be licensed by March 31st of each year according to State Statute. The information for a current rabies vaccination must be in our files or provided by showing a copy of the Rabies Vaccination Certificate. The license fee for a spayed or neutered dog is $10 and the fee for a dog that is not spayed or neutered is $20. Puppies are licensed when they are about 5 or 6 months old but after their first rabies vaccination. What day is garbage pick up and how do I contact the company? Garbage is picked up each Wednesday and should be out at the curb by 6 a.m. on pick up day. The pickup day may shift to Thursday when there is a Monday holiday. This is announced annually in the Village Voice. Harter's Fox Valley Disposal picks up the garbage. Their phone number is 1-888-804-8556. How do I get rid of large items I want to throw out? Any item that does not fit inside a standard trash bag is considered a bulky or large item. You may take these items to the Outagamie County Landfill and pay their fee or you may call Harter's Fox Valley Disposal at 1-888-804-8556 to arrange a pickup and payment. Harter's will let you know the charge for each item. What day is recycling picked up and how do I contact the company? Recycling is picked up every other Wednesday. Please see the annual schedule in the last Village Voice of the year for the schedule or call the Administration office at 779-6011. Inland picks up the recycling for Outagamie County. Their phone number is 1-888-759-0501. What can I recycle and how do I put it out? Refer to the Public Works/Utilities Refuse/Recycling page of this website for information. How can I reserve Alonzo or Miller Park facilities? Reservations for the use of the Alonzo and Miller Park facilities can be made by calling the Village Administration office at 779-6011. 920-878-0024 or email at phanlon1955@gmail.com to get a permit. Some projects that don't require a permit may require approval prior to starting the project. Call Paul Hanlon, the Building Inspector, at 920-878-0024 or email at phanlon1955@gmail.com to ask if you are not sure. Once you obtain the proper permit, please remember to contact Diggers Hotline if any excavating will be done. What is this yellow card hanging on my door? Our meter reader travels around the Village reading outside water meters so that water bills can be calculated and mailed out. Once a year, the meter reader is required to get inside your home and read the inside meter. If you are not at home for our reader to gain entrance he leaves the yellow card. Once the reading is received from you, we then compare the inside reading against the reading taken from the outside meter. The sooner you get the information to us, the more accurately we can compare. Also, don’t forget to write your name or address on the yellow card along with the reading. Does the Village have curb side pick up for yard waste and brush? Yes. Village personnel will pick up the yard waste on Mondays and Tuesdays twice a year during designated times in the spring and fall (dates may vary and will be listed in the Village Voice). Leaves and yard waste may be placed in biodegradable bags, weighing no more than 50 pounds, and placed on the curb for pick up. Yard waste that is in plastic bags or not placed next to the curb will not be picked up. If residents do not want to purchase biodegradable bags or have yard waste any other time during the year, they may take their waste to the compost site outside the fence at the Wastewater Treatment Facility located at 521 W. Cedar Street. Any waste that is in plastic bags must be emptied and the bag disposed of in the garbage receptacle. Curb side pick up for brush will take place on Thursdays the same weeks as the yard waste in the spring and fall. At these times brush no larger than 3 inches in diameter can be placed on the curb but must be in fastened in bundles no longer than 4 feet in length and weighing less than 50 pounds. Residents may also take their brush to the compost site any time of the year but must also meet the size requirements mentioned above. What can I burn and when can I burn it? Residents can now burn such items as dry leaves, non-offensive dry yard debris and other like items between the hours of 7:00 a.m. to 7:00 p.m. seven (7) days a week. Residents must show responsibility in the monitoring of the burning, must locate any fires at least 30 feet away from any structure and should only conduct such burning at those times when weather conditions do not create a public nuisance which would result in danger to either health or safety. A second alternative would be for Village residents to drop off their yard waste and brush at the Village’s compost site located by the Wastewater Treatment Plant at 521 W. Cedar Street. You can call the Hortonville-Hortonia Fire Chief, Dave Dorn, at 920-419-7872 for a burning permit or to ask safety questions. How can I pay tickets or Water & Sewer Utility bills after hours? Use the drop boxes - There are several drop boxes available to Village residents at the Municipal Services Center at 531 N. Nash St. Court fines and parking fines can be placed in the boxes located in the west entryway, Water & Sewer Utility payments can be placed in the box in the hallway accessed by the western doors and in the drive up box located by the Library book drop in the eastern end of the parking lot. These boxes were installed to assist residents in allowing them to pay their water/sewer utility bills, parking tickets or to drop off keys when the Village offices are closed or on the weekends. Pay online at www.officialpayments.com. Our Jurisdiction Code is 6828. There will be a nominal fee for this service. Pay by phone by calling 1-800-272-9829. Our Jurisdiction Code is 6828. There will be nominal fee for this service. How can I find items I left in a Village park? If you left an item in one of our parks, it is very possible that it was picked up by one of our Public Works people. Please call the Village office at 779-6011. What information is there about Building Facade Loans? This revolving loan program, which has been in existence since 2000, provides financial incentives to stimulate a visible reinvestment in any commercial business located within the Village. The goal of the program is to create a more cohesive, inviting environment as commercial businesses are encouraged to consider those improvements that fully incorporate the surrounding community. This program provides Village monies, up to $12,000.00 per property address, in the form of a loan for exterior building and site improvements. Funds may be used for, but are not necessarily limited to, the following uses: exterior building materials, paint, awnings, windows, doors, landscaping, fencing, lighting or signs. In exchange for this loan the Village assumes no less than a second (2nd) position on the mortgage of the property for a maximum of a twelve (12) year time period. If the business pays the loan back within five (5) years there is NO interest charged to the business; a 2.5 percent interest is assessed for Years 5 through 8 and a 3.5 percent interest rate is assessed for Years 8 through 12. The application process and required paperwork is short and easy to complete. Approved projects are funded on a first-come/first-served basis until all funds for the calendar year are expended. Project applications are approved by the Economic Development Committee and potential users of the program are encouraged to contact the Village Administrator at 779-6011 who serves as the Project Manager for this program.